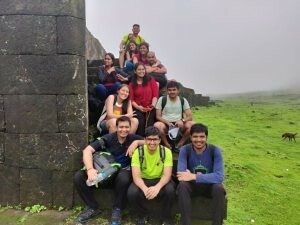 Mumbai is blessed with many great trekking trails we have listed few trekking spots near Mumbai which can be done by people from any age group. Lohagad “Iron fort” is one of the many hill forts of Chhatrapati Shivaji Maharaj. It divides the basins of the Indrayani and Pavna of the Sahyadris range. The Visapur fort is located on its eastern side. The four large gates of Lohagad are still in good condition and reasonably intact. Historical records show that in the later Peshwa period, Nana Phadnavis (1742-1800 AD) built several structures in the fort. Places to See: Pawna Lake, Ganesh Darwaza, 16 Koni Talav, Vinchukanta, attractive beauty of the pinnacle of this hilly terrain. Khandale village is situated on the Mumbai – Alibaug road. While travelling to Alibaug, one can reach Khandale village after crossing Karla pass. The village is about 4 miles from Alibaug. Since the road to the foot of Sagargad is unpaved, we can reach there by car except in monsoon. After crossing a small stream here, one has to climb up on stairs built in rocks. After about half an hour the path splits 2 ways. The way right takes us to a point where we can see beautiful the Dhondane falls. And the way to right takes us to the fort top. There is another road to the fort from Poinad village via Wagholi. Poinad is situated on the Mumbai – Alibaug road before the Karla pass. 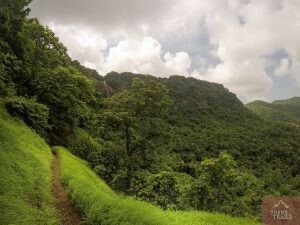 There is another path to the fort from the village Vadavali. You can take public transport from Pune and Mumbai as well till Kamshet and then to Tikona Village by sharing vehicles. 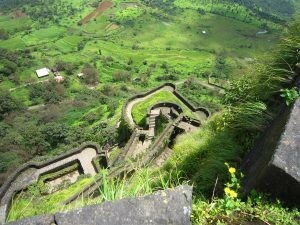 Visapur Fort is larger and at a higher elevation than its twin fort Lohagad. Within the fort are caves, cisterns of water, a decorated arch and old houses. These two roofless buildings surrounded by outer or veranda walls said to have once been Government offices. The ruins of a large stone-built house are known as the Peshwa palace. In addition to a huge carving of Hanuman, there are also several temples dedicated to him scattered all over the place. Hanuman or Maruti was likely the patron deity of Visapur fort. There is a well which local legend says was built by the Pandavas. By Train: From Mumbai to Lonavala and then by local train to Malavali Station and by road to base village. 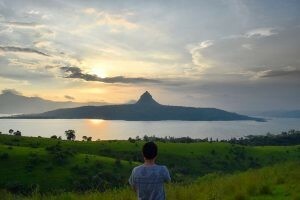 By Road: Drive towards Lonavala and then to Bhaje village.